Dr. Fuchs is a fellowship-trained board certified orthopedic surgeon. He specializes in minimally invasive surgery (MIS) of the hip, knee, and shoulder, joint replacement surgery, and sports medicine. 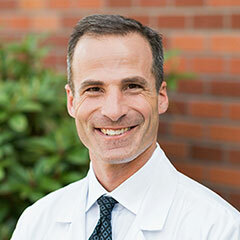 Dr. Fuchs is currently chief of orthopedic surgery at Evergreen Hospital. He completed his fellowship in joint replacement and sports medicine at the prestigious Insall Scott Kelly Institute in New York City. During this time, he worked with the team physicians of the New York Yankees, New York Knicks, and New Jersey Nets. He completed his orthopedic surgery residency at the University of Miami/Jackson Memorial Hospital level 1 trauma training facility and was awarded the Florida Orthopedic Society Resident Research Paper Award. Dr. Fuchs obtained his medical degree from the Penn State University College of Medicine while being president of his graduating class. He was the recipient of the Dean’s Award, the Medical Student Research Award, and the Medical Student Orthopedic Award. Dr. Fuchs received his undergraduate degree from the University of Washington, where he graduated on the Dean’s List and was inducted into the Phi Beta Kappa Honor Society. In his spare time, Dr. Fuchs enjoys spending time with his wife and four children. He enjoys snow skiing, water skiing, tennis, and is an avid fisherman. He also speaks fluent Czech. I believe it is important to listen to each patient and understand their individual problem. My goal is to treat every patient like a family member and design a treatment plan that will allow them to return to their normal activities as soon as possible. "If you have muscle or joint issues I can't recommend Dr. Fuchs highly enough. If I could I would give him 6 stars." "Dr. Hall was funny and very friendly. He made me feel very comfortable at each visit and with the decision for my surgery."